LIXIL has been conducting activities aimed at resolving the social and sanitation issues brought by a lack of toilet facilities through public-private partnerships and other initiatives to provide sanitary toilets to people around the world. This award recognizes LIXIL’s development of innovative and affordable SATO toilet products for developing countries, the establishment of a local production and sales structure for SATO and supporting employment based on the concept of a locally-rooted social business. 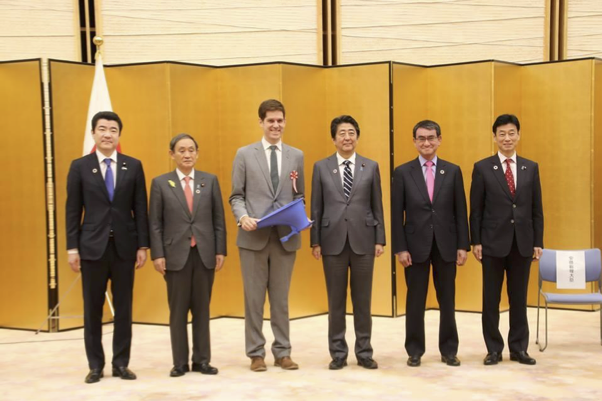 The award also acknowledges LIXIL’s measures in partnership with international institutions and NGOs to advocate for the establishment of sanitation infrastructure, as well as other contributions to addressing issues through its business activities, such as the “Toilets for All” campaign1 to donate one simplified toilet system for every shower toilet sold in Japan. LIXIL Chief Public Affairs Officer, Jin Montesano, commented: “One in three people in the world today live without access to a safe and sanitary toilet. This is a statistic that brings with it a devastating human cost. LIXIL believes everyone deserves the right to a safe, clean toilet, and has been striving to provide 1 LIXIL ran its Toilets for All campaign ran for the second time in 2018, donating one SATO product for every LIXIL shower toilet sold in Japan between April and September. 2 | Page sustainable solutions such as SATO to make this a reality. We are tremendously proud that these activities have been recognized with a Japan SDGs Award. We hope to continue improving quality of life for people throughout the world." Of the approximately 2.3 billion people that lack access to a safe and sanitary toilet, around 900 million live in conditions that require them to regularly defecate outdoors. LIXIL has established Global Sanitation & Hygiene as one of the pillars of its Corporate Responsibility Strategy, and is aiming to improve the sanitary environment for 100 million people by 2020. In addition to the SATO range of toilets, LIXIL is currently developing other products, such as micro-flush and portable toilet systems, to provide sanitation systems suited to the characteristics and needs of different environments. LIXIL also actively cooperates with external organizations to address sanitation issues. Recent initiatives include the “Make a Splash! Toilets for All” program with UNICEF, and a strategic partnership with the Bill & Melinda Gates Foundation for trials of a “reinvented toilet.” LIXIL also continues its advocacy initiatives, including delivering a keynote address on “The Sanitation Economy” at a roundtable discussion hosted by the Toilet Board Coalition held in Davos, Switzerland in January 2018. LIXIL will continue its technology development and awareness activities for areas that lack sanitation facilities, and contribute to the realization of a sustainable society. 1 LIXIL ran its Toilets for All campaign ran for the second time in 2018, donating one SATO product for every LIXIL shower toilet sold in Japan between April and September.